Students will use the grid coordinates to plot the points and create an apple. Plot the points on this mystery graph to make a picture of a sailboat on the water. Plot the points provided and reveal the mystery picture - a buffalo! An answer key is included. Be the king of the castle by plotting the grid points and creating a castle on the grid paper. This is a 20 x 25 grid but is a little more tricky than most of the basic graph pictures. When students plot the points on the graph paper and connect the dots, they'll have a picture of a Hanukkah dreidel. 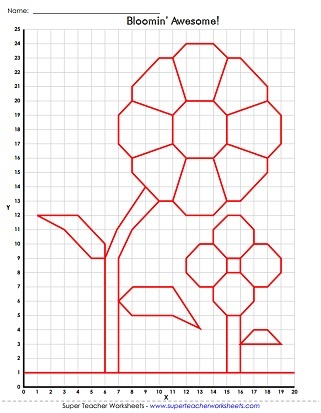 This mystery graph art picture will have your students drawing an illustration of two lovely flowers. Students will plot the given points and reveal the mystery picture: a Valentine's Day heart. Plot the coordinate pairs on the grid paper and draw the lines to make a picture of a scary Halloween jack-o-lantern. This is a second version of a jack-o-lantern mystery graph picture. It is slightly more complicated than the first version but still has a basic size grid (20 x 25). 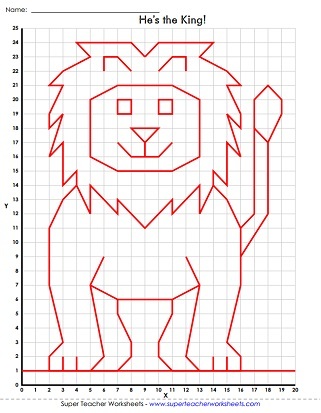 The mighty lion in this coordinate grid picture is king of the jungle. Roar! Actually, he's a really friendly-looking lion. Find the coordinate pairs on the grid paper and draw the lines to make a picture of an owl. Make a winter snowman picture by plotting these points on the grid paper. After plotting the points, students will reveal a festive Christmas tree picture. Celebrate the luck of the Irish by plotting the points on this 30 x 40 grid to reveal a pot of gold at the end of a rainbow. This of the leprechaun mystery graph picture is more advanced than the previous version. This one has plot points for the leprechaun in addition to the pot of gold and rainbow. The points on this graph paper mystery picture create a holiday picture of Santa Claus. Connect the points on the coordinate plane to create a picture of a school bus. This coordinate grid mystery picture is a school house with the word school written along the top. The plot points on this mystery graph picture reveal a squirrel. Plot the points on this four-quadrant plane and connect to reveal a picture of a dolphin in the ocean. Plot the positive and negative points on this four-quadrant plane and connect to reveal a cool robot. 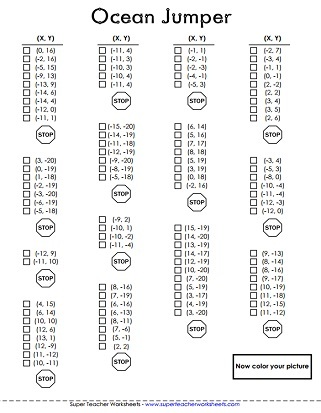 Printable bar graph and pictograph worksheets. Solve basic adding, subtracting, multiplication, or division problems and color the pictures according to the key.